Two treaty tribes recently gave hundreds of thousands of chinook fry to the state’s hatchery program to help defray losses from an extended power outage at the Minter Creek Hatchery in December. 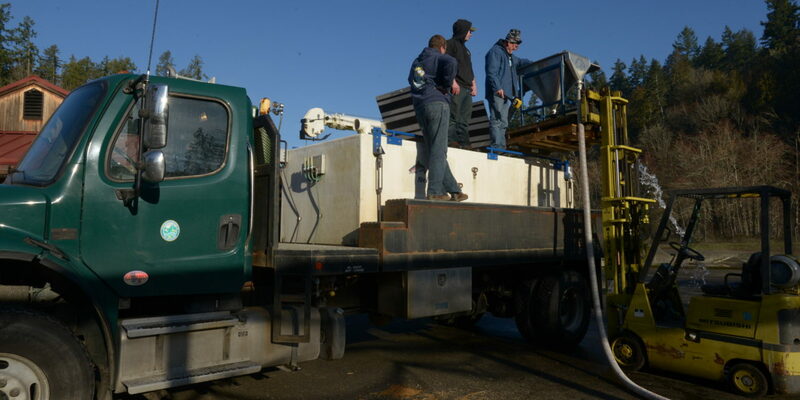 The Nisqually Indian Tribe donated 500,000 chinook fry from its Clear Creek Hatchery, and the Suquamish Tribe provided 250,000 from its program. Minter Creek lost 6.2 million chinook salmon fry following a windstorm and the failure of a backup generator. “We’re all in the same business and we all benefit from raising these fish to release,” said Bill St. Jean, Nisqually hatchery operations manager. Salmon are most vulnerable in the fry stage when they are just over an inch long, St. Jean said. With the tribal donations and fish received from other state hatcheries, more than half of the lost fish have been replaced and will be released. All hatchery chinook in Puget Sound originated from the Green River hatchery stock.